The larrgari tree (boab tree) is a defining feature of the West Kimberley landscape and has been a local food source for thousands of years. The tree comes into bloom in the wet season and green grass time, known in Bunuba as Girinybalu or Murlurru, when the larrgari trees (boab tree) produces wajarri (fruit) and jawarrjaliny (flowers). Throughout the Moonggoowarla Waljarri, (cold weather time) the wajarri flower and fall from the larrgari (boab tree) and are collected by women and children. For thousands of years, Indigenous Australians have used the shell of the boab nut as a canvas for expression, creativity and storytelling with men carving designs into the wajarri (boab nut). By painting the boab nuts, Marnin Studio has developed a contemporary interpretation of the traditional carved boab. The emergence of the painted boab nut project is a true testament to the resilience and ongoing empowerment of women in Fitzroy Crossing. Boab nuts in seasonal colours. 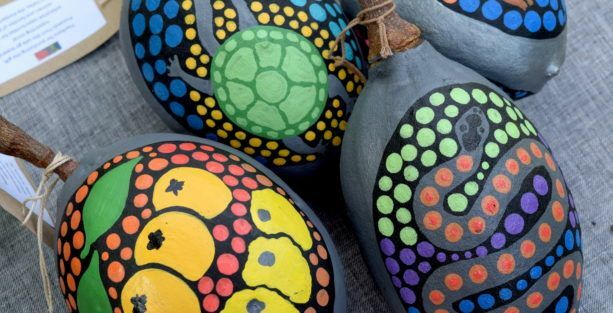 In May 2013, the women staying at Marninwarntikura Women’s Shelter started painting the wajarri (boab nuts) as part of an art therapy program focussed on assisting women to heal from experiences of violence through creative expression. Three of the women decided to try their luck selling their painted boab nuts around the Women’s Centre. June Oscar, CEO, and Emily Carter, Deputy CEO, recognised the entrepreneurial spirit embodied within these nuts and decided to purchase them. June and Emily were happy to support this new development and the women, happy with their payment, made off to the local supermarket to buy some tucker for their families. Later in the year, a visiting CEO sighted the painted boab nuts and asked the women if they could paint 100 boab nuts as end of year gifts for their company. Marninwarntikura put the word out among the surrounding communities and decorated boab nuts started flowing into the centre at a huge rate. The following year, the Ark Clothing Company purchased 300 boab nuts for their Christmas shopping season, stimulating the development of Marnin Studio. Marnin Studio is now working with more than 70 women from the eight surrounding communities. In addition to boab nuts, they are now producing a range of textile and paper-based products using screen printing, bush dyeing and block printing techniques. All of the Studio’s products blend a contemporary approach with native bush colours and patterns based on the unique experiences of each painter. To support the women’s artistic development and design skills, the Studio is now also running an Artist in Residency program, bringing professional artists up to Fitzroy Crossing four times a year to help the women transmit their cultural knowledge of place into high quality products. Marnin Studio however is about more than just making and selling products. It is about creating a safe space where the women can come together and feel proud about who they are and where they come from. In supporting the women to develop products that celebrate country and culture, Marnin Studio is empowering women through skill development, economic opportunities and strengthened identity. In addition, by sharing their products and stories across Australia, the women of Marnin Studio are defining a new strength-based narrative for their families and the Fitzroy Valley community.